Business electricity customers in South East Queensland are able to choose their energy retailer as well as select either a competitive market contract or stay on their existing standard contract. This includes all energy users within the Energex distribution area, covering an area that includes Brisbane, Gold Coast, Sunshine Coast and Ipswich. Learn more about electricity market deregulation in Queensland. Households and small businesses outside of this area comprising of primarily regional and rural energy consumers continue to have their energy supplied by Ergon Energy, and do not have the ability to switch to a competing retailer. However standard contract tariffs are regulated and subsidised by the state government to ensure tariff rates match those of standard contracts in SE Queensland. Learn More about electricity rates outside of Queensland's deregulation area. Can I switch my business electricity provider? If you are unsure of which distribution you fall into and whether you are able to compare market contract offers from other retailers, enter your contact details in our online form and one of our energy specialists will call you back to confirm your options and help you switch if we can find you savings. Our comparison service is 100% free and takes just one simple phone call. 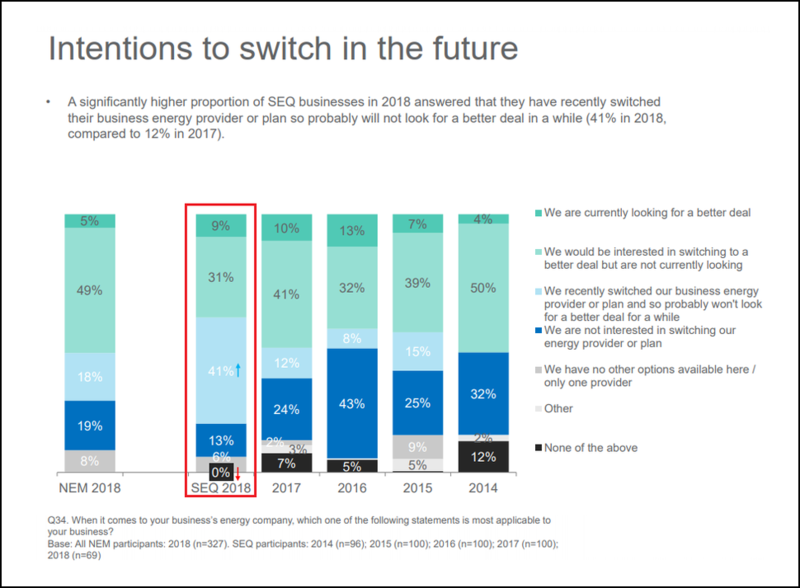 6% said they had only one provider in their area. Source: Australian Energy Market Commission: 2018 Retail Competition Review - Small Business, p. 112. How much can Queensland businesses save on their electricity costs? According to an analysis of over 1,000 Queensland small to medium business energy users who contacted Make it Cheaper Australia from 1 January 2018 to 1 June 2018, 84.3% of businesses were on an electricity plan that was more expensive than a market offer available from our panel of available retail providers. In the same analysis, we found the average SME business electricity plan saving was $663. Individual business electricity requirements and usage patterns will differ. If you want an easy way to compare multiple retailer plans across our panel of energy companies, contact Make It Cheaper Australia today on 1300 957 721 for a free energy comparison, or leave your details to receive a call back during business hours.